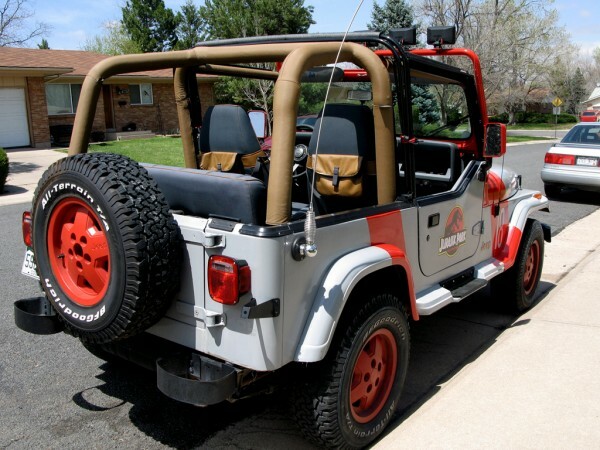 All the Jeeps in Jurassic Park feature a CB antenna (but no CB radio has been seen) that is mounted to the rear of the Jeep with a 102″ antenna running up in a loop to the front windshield. The antenna mounts to the Jeep with a standard surface ball mount with a spring inbetween. The parts can still be purchased from CB retailers such as Radio Shack, although available online only. The antenna is mounted to the rear of the Jeep on the main body pan. The antenna is secured to the windshield frame to prevent flopping around. What is the proper way to secure the whip antenna to the windshield? The Movie accurate way is with a hold down bracket attached to the light bar. It appears this was just some stuff the shop had lying around. It is not a standard “part” that can be bought. I choose to use a rope tie down, which I attached to my lightbar, as I found the extra flex of the rope kept the antenna from banging into the jeep/top/rollbars as much.